We are going from a house that's full of expensive to an apartment that's full of cheaper. This should be a good and happy thing. Anyway, I am crazy looking forward to it, but tomorrow much of our stuff will be collected by some people who will auction it. Which should mean money but certainly means I won't have to move it or trip over it anymore. So, yay. In the mean time, though, I am spending my days serving my community as a juror. Which is about the alpha and omega about what I can say about it. But, right now, at this moment, I have my PCs shut down and packed up. I just have my netbook and my phone. I like covers, I love fingerstyle and I begrudgingly accept Lady Gaga. Good stuff here. 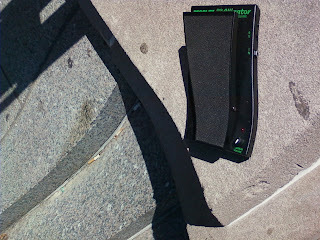 I am now the proud owner of a Morley Little Alligator volume pedal. I have plugged it in just long enough to be assured that it works, which it does, but soon it will hold a prized place near the end of the pedal chain, after the dirt but before the tremolo (and the eventual delay pedal). The Morley has an optical mechanism, so there should be nothing that wears out and needs to be replaced. It does have a minimum volume pot which should last as it's not connected to the main mechanism and fairly fire-and-forget. I had planned to make it drop to zero, but I'm curious if I can set it to tame my Digitech Death Metal pedal and have it still be able to handle nice, clean steel-type swells. The Morley volume pedal has a reputation for being closer to an on-off switch, but I've talked to Morley people and I feel confident that I can adjust it to what I need it to be. Tonight I'll be testing it out some. run off the assembly line. Ain't There One Damn Song That Can Make Me Break Down And Cry? I first heard it by Chris Smither on a CD of songs done at Newport Folk. Every version I heard makes me cry. I want to have a band that plays David Bowie's "Young Americans" just to break at that line, move into "Killing The Blues" and, when done, switch back to Bowie. I've just finished a compact-disc census, creating a list of all the (non-burned) CDs I own. It's in a database and everything. So, a simple SQL query* tells me how many CDs I have by artist, thus giving a hint at who my favorite artist is. I think this list contains items that everyone expected, as well as items that nobody gets. Labels: aping bruce springsteen, offerings of sound, separated at birth? Henry Kaiser And His Allan Beardsell Guitar from fretboardjournal on Vimeo.